Bedbugs are small, oval insects that feed by sucking blood from humans or animals. Bedbugs do not fly. Bedbugs can live anywhere in the home. They can live in cracks in furniture or in any type of textile, including upholstered furniture. They are most common in beds, including the mattress, box springs, and bed frames. Bedbugs are most active at night. They may bite any exposed areas of skin while an individual is sleeping. Common locations for bedbug bites are the face, neck, hands, and arms. 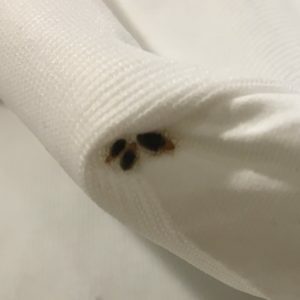 Typically, no treatment is required for bedbug bites. If itching is severe, steroid creams or oral antihistamines may be used for symptom relief. If you live in an apartment or condominium, it’s best to alert the property manager right away. In multi-family housing a manager-coordinated bed bug control effort using a pest control company is generally needed. Bed bugs readily move from apartment to apartment, with many people unaware that they have a problem, so chances are that you will not eliminate a bed bug problem by yourself. If one apartment is infested, adjoining units should be assumed to be infested unless shown otherwise through inspection or monitoring. Simply asking tenants whether they have bed bugs is not enough. In one study only half of residents in a large apartment with bed bugs knew they had a bed bug problem. Multifamily housing, hotels, or any business providing lodging must be treated for pests by a licensed pesticide applicator.